October 31, 2015 October 29, 2015 by Beau H.
A simple shirt made in a not-so-simple way, via the new Zady Man collection. If you hadn’t heard of Zady before the start of this week, there’s a good chance you have now. The ethical E-commerce company has slowly turned heads in recent years for its hyper-sustainable approach to the fashion industry. In short, the brand has set about stocking and selling only ethically produced, high-quality clothing — think buttondowns from Apolis and canvas coats from United By Blue. It’s a more sustainable, yet no less premium, version of East Dane. And now, Zady itself is making a small line of essential items for men — hence the resultant mini-media frenzy. If that didn’t catch your eye, the line of intensively-produced basics is sure to grab you away from Twitter for a few seconds (caught ya, yeah?). 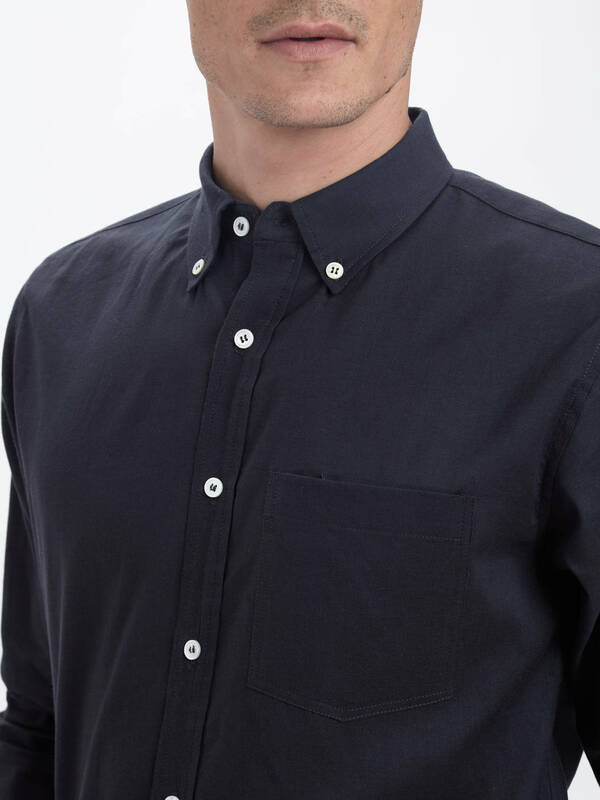 Of the well-curated colection, which includes a lightweight alpaca sweater and a crisp white Oxford, the simple navy buttondown is certainly one piece that has the potential be both on-trend and highly versatile. Mother-of-pearl buttons made ethically team up nicely with a slim fit & other typical shirting details. It’s crafted from long staple organic cotton sourced from Turkey for a premium feel — and admittedly, a higher price tag than you’d find at a place like J. Crew ($130). But even the mother-of-pearl buttons are made sustainably using waste from the shellfish industry. And the product page itself does more than just toss up a few photos of the shirt. There’s an entire primer on what makes the shirt’s organic cotton — and other components — so special. It’s rather unexpected, but dovetails off nicely from what brands like Everlane are doing in terms of transparency to consumers. Oh yeah, and the styling potential of the shirt is pretty on-point. Toss it on with slim tan chinos and white leather sneakers for a fail-safe everyday look this fall, and wear it with some slate-grey linen shorts (as seen here) as it gets warmer out. It would also look right at home under a brown wool blazer and grey trousers this fall, and if you’re feeling daring, you could pair it with a more faded pair of dark denim and an elbow-patch cardigan for a stab at the monochrome trend that’s picked up so much steam. The point is this: Zady appears to have hit it out of the park with its first stab at a private collection, and although the initial price tag could sting for those of us a bit strapped for cash, it could very well be a splurge worth saving for — or putting on your list for Santa? Have you bought any third-party merchandise from Zady? What do you think of its own collection? October 30, 2015 October 30, 2015 by Beau H.
Now that it’s Friday, my voice has finally recovered from… wait. Wait a second. That was how last week’s Friday Read started, too… and as luck would have it, it did indeed take me all week to recover from quite the cold — and quite the fun weekend — back in my home state of Michigan. Visits like that are always special, and they give you an excellent opportunity to reconnect with your roots and see old family & friends. To say I’m thankful for where I’m from would be an understatement! And it’s great to be able to write about it through this blog — so thank you for reading, commenting, clicking and participating in giveaways; you can be sure more are to come! In fact, if I were you, I’d pay close attention to this site (and my Instagram) on Wednesday and Thursday of next week if you’d like some great fall and winter gloves from my pals at Iron & Resin. But in the meantime, don’t get too spooked this Halloween weekend and enjoy your Friday downtime! This was pretty big news earlier this week, so if you haven’t seen it, best read up. Outdoor retail giant REI is closing its doors on Black Friday for the first time in its history as part of its #OptOutside campaign; have to wonder if others might follow suit? Want to upgrade your business-casual style? The ever-reliable team at Dappered has you covered with this standout suggestion. Here’s one for all you beer geeks — and advertising folks, too. Digiday reports that Heineken is teaming with a select set of designers to produce special one-off pieces for gifting to top industry influencers — take, for example, an older pair of Mark McNairy saddle chukkas with a Heineken green sole. Fascinating stuff, and they’re not the only beer brand involved in similar partnerships, either! One last quick note on the style front — you might recall the great team at Satchel & Page (of Slim Mailbag fame) — well, the brand just launched its new Autumn/Winter line via Kickstarter, and each piece is absolutely worth your time and dollars. Long Read of the Week: If you’ve spent any time in New York City, you might have heard rumors about the infamous ‘Mole People,’ who dwell beneath the city in its subway tunnels — Narratively has the full scoop on that spooky story this week. Catch up with a new release from two heritage-quality brands — Tanner Goods teamed up with Danner once again on an excellent set of special-edition seasonal boots, as I covered for VOUCH Mag. The great folks at American Trench do standout merino wool caps for winter (in addition to great socks), and those caps were the subject of my newest GearHungry feature. 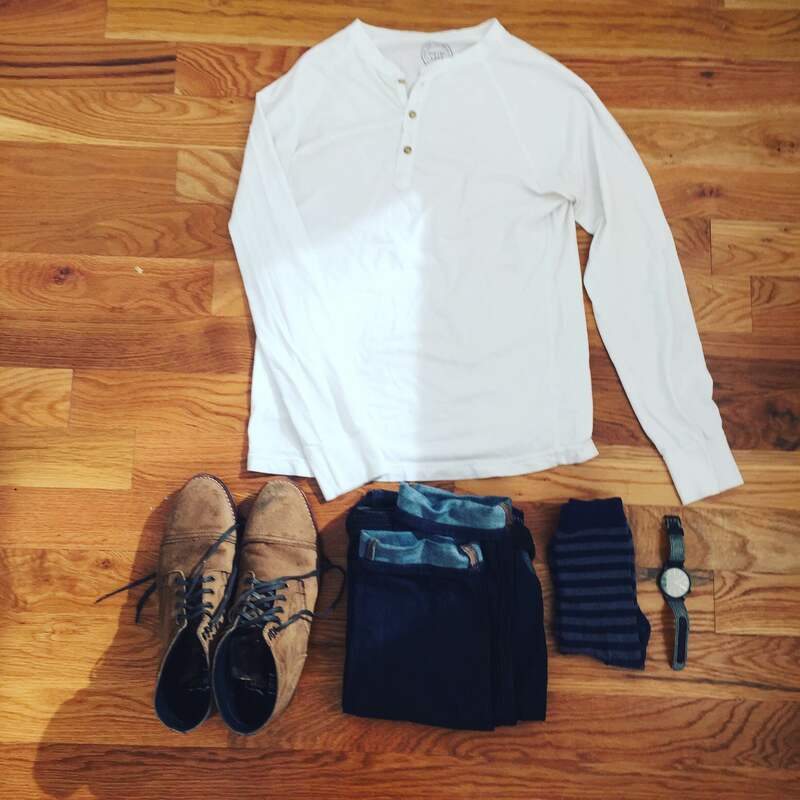 October 28, 2015 October 28, 2015 by Beau H.
Megan Collins of Style Girlfriend dishes out on-point style advice to guys on the daily — worth the read. Photo courtesy of the site. Editor’s note: Head this way to see more Style Q&A entries. As I’ve spent more and more time reading about the menswear world, there have been certain sites that have shaped the way I view style, fashion and getting dressed daily along the way. My friend Barron’s site, Effortless Gent, is one such outfit (pun intended). Dappered and what Joe has done over there also comes to mind. 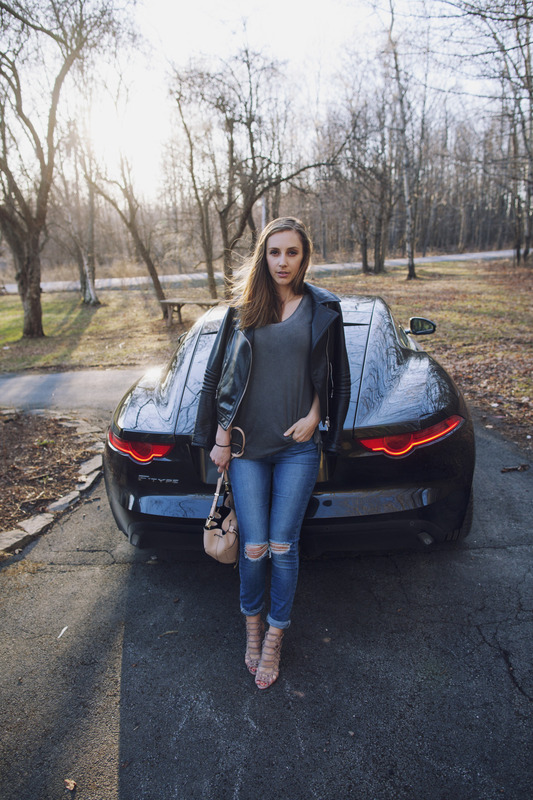 And of course, no discourse on the digital menswear and lifestyle community would be complete without mentioning Megan Collins of Style Girlfriend. The site is well-designed, easy to navigate, fun to read and packed full of useful menswear tips and tricks (and much, much more), from how to wear a turtleneck to a full rundown of some of the best gear for fall. Anything lifestyle-related you might need to know, rest assured that’s Megan and the team are on it. Her Fall Style Guide in its entirety is also great, and the site’s Twitter churns out excellent content, too. Toss in handy and informative lifestyle articles and even relationship advice and you’ve got a winning combination. That it’s all told from a female point of view, yet geared toward guys, is especially helpful (particularly that relationship bit, ehh?). I’ve had the chance to meet Megan on a few occasions here in NYC and have always appreciated her insight and new way of looking at a holistic lifestyle for guys — starting with clothing but branching into much, much more. The adage that the details make the difference is definitely clear via her site. So without further ado, I’m very excited to present the latest entry in this series — I promise, I’ll just ask the questions. TSG: For those who aren’t familiar with your site, tell us how you got it started and where that inspiration came from? MC: I always say, I wish I could tell you I did this sweeping competitive analysis of the menswear landscape and found a female voice was missing from menswear, but actually I just fell into it. I had left a career in advertising to write and was taking on any project I could. At the same time, a friend was starting a custom suiting business and asked me to write a weekly column for his site. I said yes, because I was saying yes to everything, “But I don’t know anything about guys’ style…is that okay?” I asked. “Sure, just write about what girls like to see guys wearing,” he said. It ended up kicking off this amazing journey that’s culminated in a really satisfying career for me, connecting with guys who may have GQ at home on their coffee table, but they’re shopping at the mall and need help bridging that divide between aspirational and accessible. 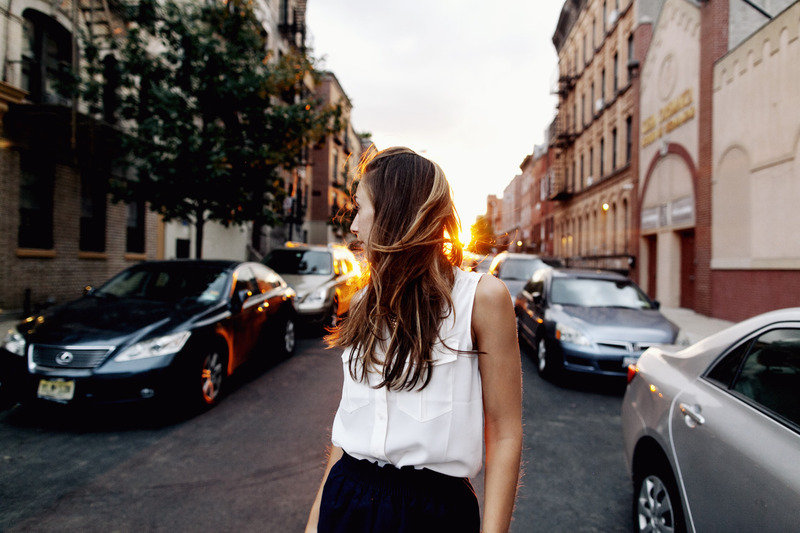 I believe Style Girlfriend has gained such a following because, 1) I shop like a guy – I want it to be easy, I want it to be quick, so our advice is all about tips, tricks, and shortcuts to great style and 2) I’m honestly not that interested in fashion. Style matters to me, because having great style is like having the best wing man ever – its only concern is making you look good. Fashion, though, is fleeting, based on trends, and honestly, can seem kind of silly sometimes. I’m much more interested in helping guys on their personal style evolution than I am in talking about the latest sneaker drop or runway show. What started as a nationally syndicated newspaper column has developed into a widely read site. Photo courtesy of Style Girlfriend. TSG: Running a style with as large a following as yours seems like a lot of work – what’s a typical day like at SG HQ? MC: I wake up early – 5:15 or 5:30 a.m. – and take some time to read, write, and get centered for the day. Then I work out. If I don’t break a sweat every day, I go completely insane. I signed up for Classpass earlier this year, and it totally rocked my world. I get bored easily, so I can do spin on a Monday, bootcamp on Tuesday, Pure Barre on Wednesday, and on and on. It’s great. By 9:30am, I’m in the office in the Flatiron District. My editor gets in at 10, we talk through what’s going on for the day – -what’s on her plate, what’s on mine. Then I usually pop in some earbuds and churn through whatever’s on my to-do list. Relationships are so important, so at some point during the day I might meet up with someone from a brand, an agency, or someone running a site like mine. Most nights there’s some event to hit, then I come home and crash pretty early, so I can get up and do it all again tomorrow. TSG: What have been some of the challenges involved with getting Style Girlfriend up and running that people might not know about? MC: Style Girlfriend winds up getting lumped in with a lot of men’s personal style blogs, but it’s really not, so sometimes brands don’t know the best way to work with us. It’s not as simple as, “I wear your brand and tag you on Instagram.” It’s not a personal style blog; I’m not on there with pictures of what I wore today, and yesterday, and the day before that. Don’t get me wrong; those blogs are great, and I get a ton of inspiration from what others out there are doing and their amazing style, but we really see ourselves as a media company, or a digital magazine. We’re talking about menswear the way an Esquire or Details would – in articles and editorials and videos. So we’re a bit of an anomaly in the digital menswear space in that way. It just means it can be a bit more leg work to help brainstorm those partnerships so that we can create really amazing branded content for our readers. So we’re different – but that’s also what makes us special, so I’m glad for the distinction. TSG: What’s one style essential (or an essential outfit) that every guy should own? MC: Every man needs a suit that fits him just right. Whether it’s grey or navy is a personal preference, so long as it’s tailored and doesn’t jut out at the shoulders or pool at the ankles. I tell guys to make friends with their tailor. You can take clothes you buy off the rack and make them look made-to-measure for a pretty small amount of money. Style Girlfriend is much more than your average style blog — its lifestyle section is packed with more great content, too. Photo courtesy of the brand. TSG: What’s one style mistake you see too many guys make? MC: Wearing clothes that don’t fit them properly. I tell guys to make friends with their tailor. Everything you own (nearly all of it, anyway) would look 10x as good with just a few inexpensive alterations. An inch at the ankles, a nip in at the waist – there’s so many small things you can do to make your clothes look like they were made just for you. 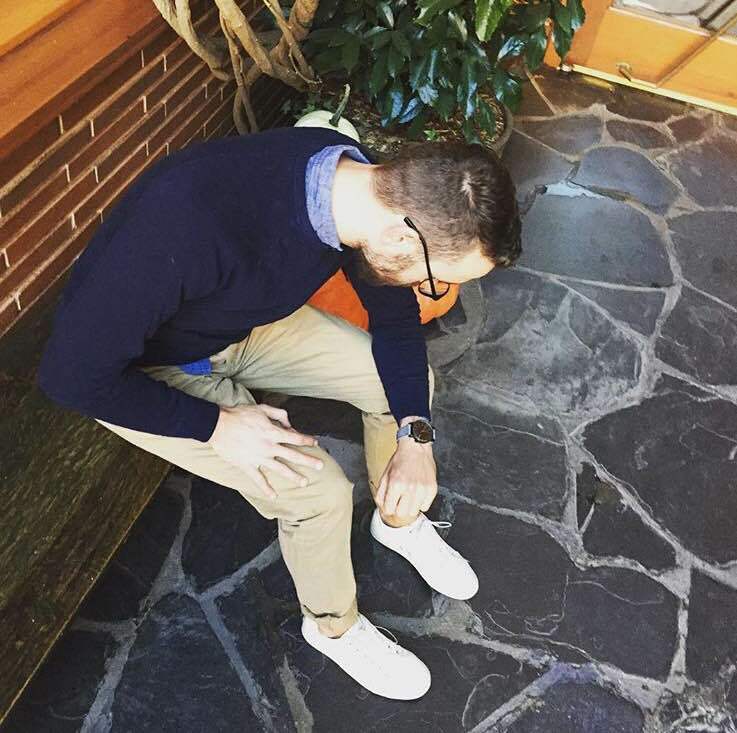 TSG: What’s been the most rewarding part of helping guys improve their style? MC: Hearing about the positive impact that dressing better has had in every area of their lives. I really believe that when you look good, you feel good, and that confidence ends up spreading to every area of your life. And this is borne out in the emails I get from readers telling me crazy inspiring stories about how reading Style Girlfriend helped them bounce back from a divorce or being laid off. How they decided to go after a raise or a promotion, or ask out that girl they’d been in love with forever. Taking control of your personal style is truly the first step to totally changing your life for a lot of these guys. I have definitely been brought to tears more than once hearing from readers about their transformations. TSG: You’re based in NYC — for those new to the city or visiting, what are some of your must-visit spots — a restaurant, bar, gallery or the like? MC: I just moved from the Lower East Side to the Lower Lower East Side (yes, it’s a thing), and I love it. So many good restaurants and bars – a few of my favorites: Mission Chinese, Bacaro, Dimes, Clandestino, 169 Bar and Kiki’s. TSG: Lastly, as it’s the fall season – what’s one trend that guys should jump on to look their best in the coming months? MC: Take advantage of the layering season – I love a nice textured sportcoat over a patterned button-up with a tie that contrasts while complementing. Top it all off with a mac coat or field jacket and you are ready to take over the world. Head over to Style Girlfriend for more great menswear content, and check out the site on Twitter. October 26, 2015 by Beau H.
Editor’s note: For more excellent product reviews, click here. For a watch that combines high-low style with fall texture, look no further than KOMONO. Slim chinos by Taylor Stitch. Crewneck sweater by J. Crew. Chambray shirt by GAP. Glasses by Warby Parker. White sneakers by GREATS Brand. So this blog has talked more and more in recent months about small style upgrades — the little changes you can make to your daily ensemble (and accessories) that make a big difference. This is no more true when it comes to something like the watch you choose to wear every day. While watches aren’t for everybody, they can certainly provide a measure of calm and order in a world increasingly ruled by iPhones and the like. I myself am a big fan of watches, and I’m always keen to examine timepieces that strike a certain balance between nice looks and reliable performance. KOMONO is an accessories brand that sometimes gets lost in the wash — while they also make sunglasses, they produce timepieces that aren’t as affordable as a Timex, and yet aren’t sold through a mass-market third-party retailer like Amazon. Consider the fact that its watches are sold digitally next to a Euro symbol and you have enough to leave many regrettably confused. That’s their loss, however. The Winston Herringbone from KOMONO brings unique texture while standing up to dark denim & boots with ease. Selvedge denim and black moc toe boots by Timberland. 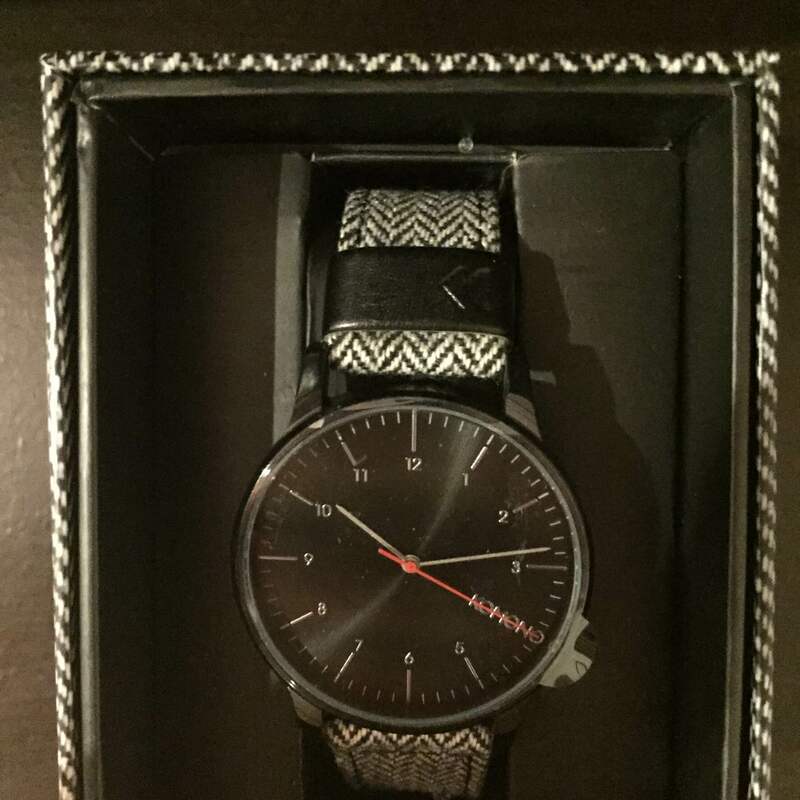 I had the chance to check out the KOMONO Winston Herringbone Watch over the past few weeks (as featured on this site’s Style Pick of the Week series last month), and I’ve been nothing but pleased with the combination of value for the price. As I’ve said in the past, I’m no watch geek by any means — I leave that to the experts. I do know what I look for in a reliable timepiece though — durability, function and nice looks. And the Winston Herringbone from KOMONO definitely provides that. It’s a rather unique watch in that the cotton herringbone strap makes it the sort of timepiece that stands up to the chillier temps of fall and winter. In the same way that a sturdy NATO strap can inject color, pattern and function into a regular warm-weather watch, a timepiece with a thicker strap like this actually does better as it gets colder. Herringbone is a legendary cold-weather fabric when applied to blazers, so to dial it down into a watch is a pretty neat move. This also means it’s not an everyday watch that can pair with multiple outfits. Crucially too, this watch isn’t the first one you should buy if you’re just starting out — something like a silver dive watch would work across all four seasons and in any situation imaginable, while a nice brown leather watch might also strike a good balance if you dress both casually and dressy on a frequent basis. However, if you seek the definition of a fall and winter watch, this is it. And for what you might call a ‘seasonal’ watch, its price tag (barely over $90 USD) isn’t bad at all. An appropriately-fitting patterned case and a clean dial make this KOMONO piece stand out. The Winston Herringbone features the remarkably crisp and clean dial for which KOMONO is known, ands adds numerals at the hour markings — something that some of its other timepieces don’t use on occasion. The black face and red seconds marker provide a similar contrast to the Timex Weekender — yet this watch looks decidedly more modern. Some might not like the ‘KOMONO’ placement as opposed to the number ‘4’ at that marker, yet it still manages to complement the overall look (in my opinion). Its 41mm dial is heftier than a Weekender (and many other minimal watches), and the case is also thicker. The thicker case is actually to its advantage, as it’s not the type of watch that might get overwhelmed in a fall or winter outfit filled with more texture. That means that it’s likely confined to use during those months, however — unless you live somewhere cold year-round (Brr!). It runs and winds quite smoothly — there’s no ‘tick-tick’ sound as you might encounter with other, less expensive watches (I.e. the Weekender). But don’t call it a full-blown dress watch as of yet. The thicker case and those numerals around the edge of the dial make it much more casual — and that’s all the better to wear with fall outfits. While it probably won’t work with a tuxedo or even a four-season suit, it’s the ideal type of watch to wear with a navy flannel suit — the strap complements the heavier texture perfectly. The perfect type of outfit for the KOMONO Winston Herringbone Watch. Slim denim by Mott & Bow. White henley by Pistol Lake. Boots by Thursday Boots. Socks by American Trench. A with most fall gear, this watch will be at its best paired with like-minded seasonal staples — like a suede bomber jacket, some roughout leather boots and dark denim. Taking the chance to pair with something like a shawl cardigan works, too. And although it’s a black herringbone pattern, that texture on the strap makes it more like a black rubber-strap watch — as long as you wear it casually, it can be paired fairly freely with black and brown leather boots alike. That goes particularly for leather high-top sneakers and the like. It also seems to add a slight jolt to more monochromatic outfits — wearing navy trousers and a navy sweater doesn’t seem all that much when you mix up a watch strap with some texture. Of course, it’s just different enough to set itself apart from other watches out there — it’ll draw more attention than a regular ol’ NATO strap out and about. That being said, it’s not the kind of watch that could likely take a substantial beating. So if you’re looking for a watch to do some fall chores, it’s best to leave it inside. But the rest of the time, it’ll do more than fine. That’s about the most you can ask for from a seasonal watch that retails for under $100. And while the rest of its selections are worth checking out, KOMONO seems to do a nice job with timepieces that strike a decided niche — like this green-dial number. The Winston Herringbone certainly falls among that class, and it’s worth your time (pun intended) if you need a watch to fill the gap between dressy and casual, cold weather and warm weather. Have you heard of KOMONO watches? 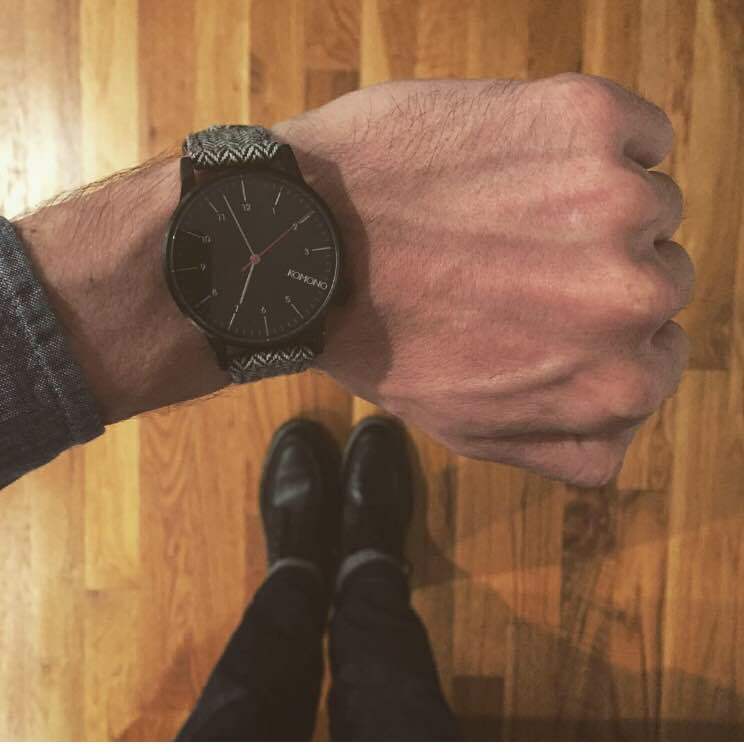 Would you pick up the Winston Herringbone Watch? October 24, 2015 October 22, 2015 by Beau H.
Pick one or pick ’em all — just one of several solid sock options from American Trench. The photo and title of this post isn’t a mistake, trust me. We’re just talking about socks, right? Indeed. 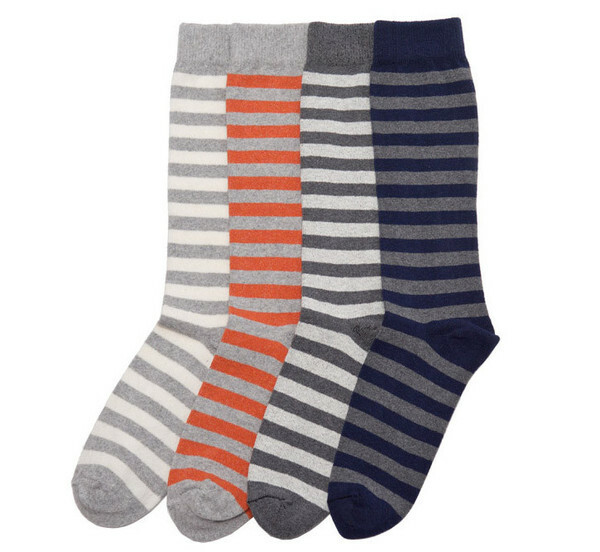 A great pair of socks is indispensable no matter the time of year, be they a no-show pair for the warm days of summer or something a little thicker — like these Cotton Rugby Stripe Socks from American Trench. You might recognize the brand from a past entry as part of this site’s Style Q&A series, and if you haven’t paid attention to date, it’s best time you start. The brand is all about crisp, clean, understated designs, something that sets them apart from other sockmakers who favor bolder, louder patterns. A pop of color or a great pattern is definitely to be commended, and those are the types of socks I wear myself more often than not — yet when a knitwear company lets the fabrics and materials speak moreso than the pattern, that’s when you take notice. American Trench manufactures its socks at family-owned mills in North Carolina and Pennsylvania, and does so in small quantities — so you definitely get what you pay for. And at $44 for a 4-pack of the socks pictured above, that’s a very good thing. 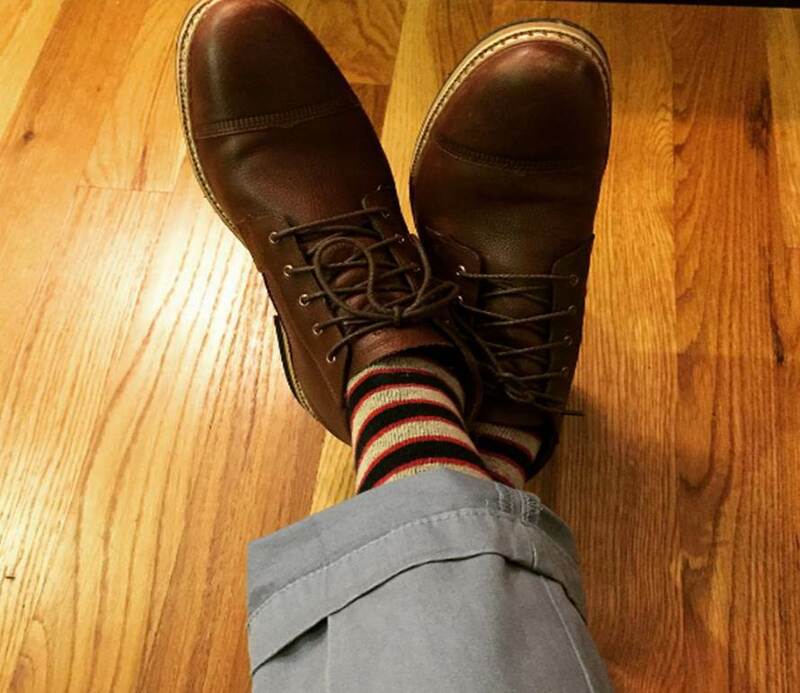 The medium weight and striped pattern make these socks a great pair to ground complementary colors. Sky-blue chinos by Combatant Gentleman. Waterproof chukka boots by Timberland. That’s one thing to note about the brand’s socks overall — they are indeed pricey compared to your average pair. But you get the choice of some intriguing fabric blends — pima cotton and superfine merino are but two picks — plus a nice swath of colors fit to pair with everything from inky blue denim to grey chinos. And as you can see above, the brand’s Triple Stripe sock offers a solid complement to some sky-blue chinos, too. After testing out some pairs through this fall, these socks are every bit as good as advertised — and priced. They’re comfortable, breathable and stylish. There are small points of reinforcement (or what feels like thicker fabric) at heavier wear areas, and they don’t slide down your calves throughout the day thanks to a spandex-lycra blend. The option to select from some neat designs, like a zany-yet-reserved Fair Isle pattern, is another bonus. The pairs I’ve tried out — including those Fair Isle socks — fit comfortably in some sturdy boots, and they also fit in just fine with a nice pair of leather sneakers. Add all this onto the fact that they’re durable, comfortable and made in America, and you might not want to buy from another sock brand this fall — or any other season. Do you own any socks from American Trench? How do you like your socks — wild and wacky, or more reserved? October 21, 2015 October 28, 2015 by Beau H.
Rocking an unexpected style from a heritage hat brand. Read on to win a gift from Goorin Brothers! Unconstructed blazer by J. Crew. Heathered burgundy pocket tee by Steven Alan. Slim khaki chinos by Taylor Stitch. Chukka boots by Timberland. Glasses by Warby Parker. Editor’s note: Thanks to all who participated! And congrats to the giveaway winner, Ali N.! Stay stylish, folks. There are some brands that do one thing so well, you can’t help but stop and take notice. Goorin Brothers, heritage hatmakers for more than a century, absolutely fit the bill. After seeing some of the brand’s shops around Brooklyn and Manhattan across the past six months or so — four shops in total — my interest was piqued. I connected with the brand’s lovely PR team and have since been fortunate enough to learn lots more about Goorin — and it’s no exaggeration to say it’s been all good things (read a full brand profile here). A nice hat is a style accessory that not all will be interested in, granted, but if you do decide to go that route, there’s no better place to look than Goorin. It’s a company that’s rooted in quality and family principles, and they make just about every hat style you can imagine, from felt fedoras to flatcaps and perhaps my personal favorite as seen above, a line of vintage ballcaps. 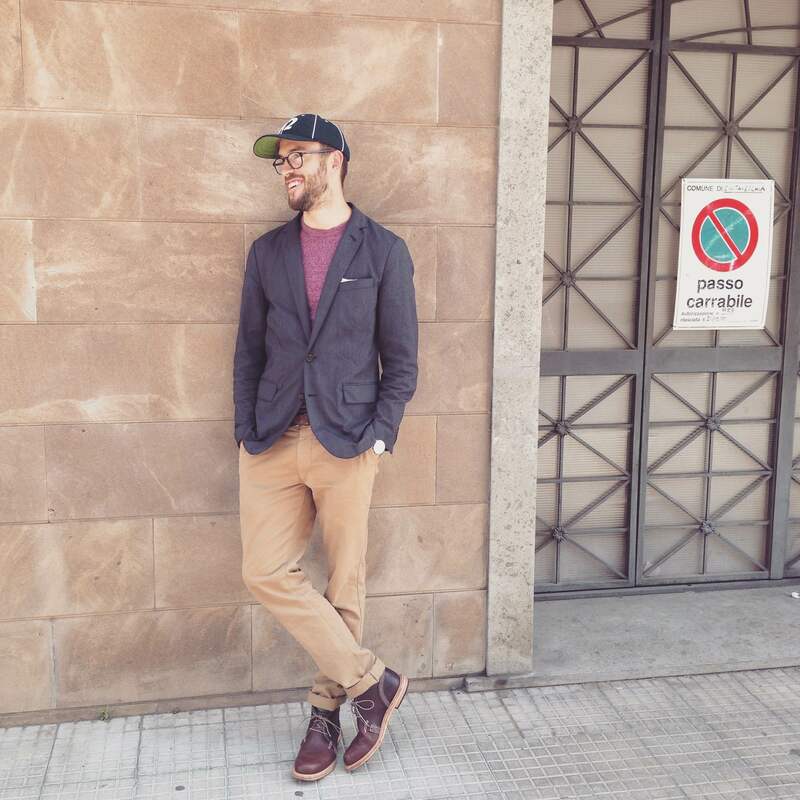 But, it’s perhaps the more classic fedora or flatcap styles that pair best with all kinds of outfit combinations in the fall — from a rugged henley and bomber jacket to some sharp tailored wear. That’s the best mark of a great hat, as with any style item — versatility! And Goorin sure does craft them well, as they’re fit for any adventures you might find yourself on this season. I’m personally looking forward to breaking mine out as it gets colder in NYC, although they make several varieties fit for warmer weather. I just need to get my hands on one of the brand’s felt fedoras and I’ll be all set — I’d advise you do the same! While I could go on about the brand, there’s a bigger upside to this post (assuming you’ve made it this far) — the chance to pick one up for yourself! So, here are the goods — 1 lucky winner will receive one $150 gift card good for purchase at any Goorin Brothers shop (36 of ’em nationwide) or the brand’s Web site — that should cover most hats on the site! Like Wednesday’s Goorin Brothers-themed photo, and in the comments, tag a friend who you think could use a Goorin Brothers gift card — and by extension, a hat! Be sure to use the hashtag #StyleAdventures, too (and lastly, be sure to do so before 9 p.m. THURSDAY — we’ve extended it by one day!). As per usual, the winner will be notified via Instagram Wednesday evening following the conclusion of the contest. So those are the nuts and bolts of this giveaway — good luck!